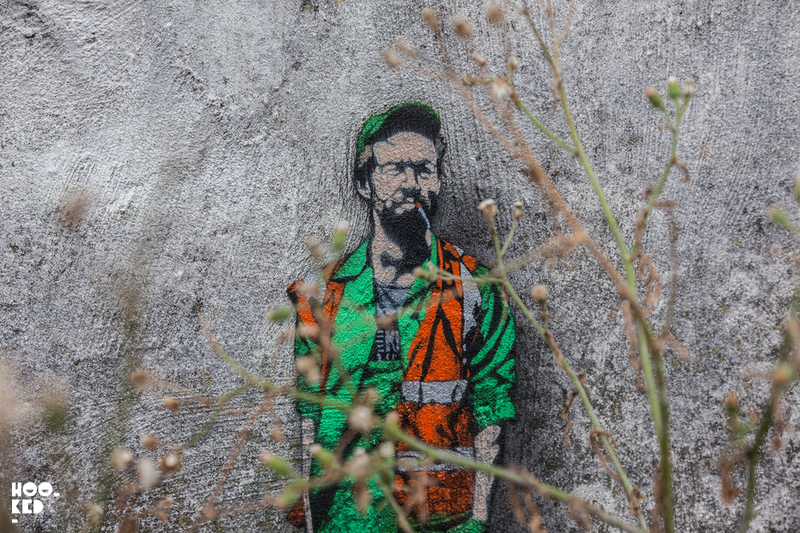 Earlier this year while we were visiting Oostende, Belgium Hookedblog were introduced to the street artworks of Jaune, a stencil artist and urban interventionist from Brussels, Belgium. The artist was among those invited to participate in The Crystal Ship festival which was also taking place in Oostende and the reason for our visit to the coastal city. Having discovered a number of Jaune's street work on our travels around Oostende while shooting the larger murals going up we were fortunate enough to catch up with the artist during our visit. 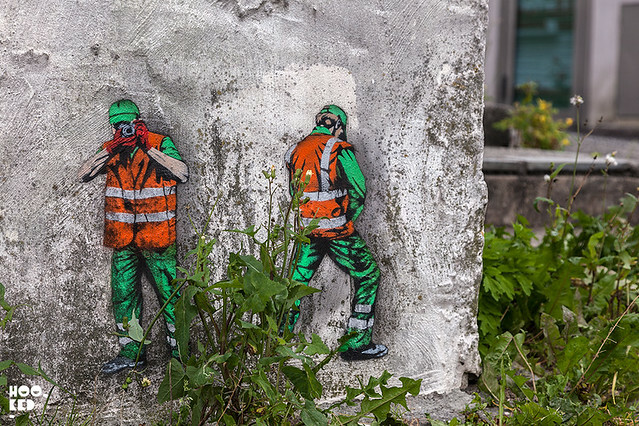 Jaune invited us to join him on one of his stencil missions to capture some images as he installed what was the largest piece of the 40 or so different stencil works sprayed onto the cities walls. The work featured a number of sanitation workers sailing across an ocean of trash bags in a gondola boat. If you missed our previous post you can have a look at these images from Oostende in this post titled "Belgian Stencil Artist Jaune sails into Ostend for The Crystal Ship Festival". Jaune’s participation in the Nuart festival comes as part of a newly-formed collaboration with Belgium’s The Crystal Ship Festival (Previously on Hookedblog), which saw Nuart invited to curate Biancoshock (IT) and Isaac Cordal (ES)(Previously on Hookedblog) into The Crystal Ship’s inaugural festival in April of this year. 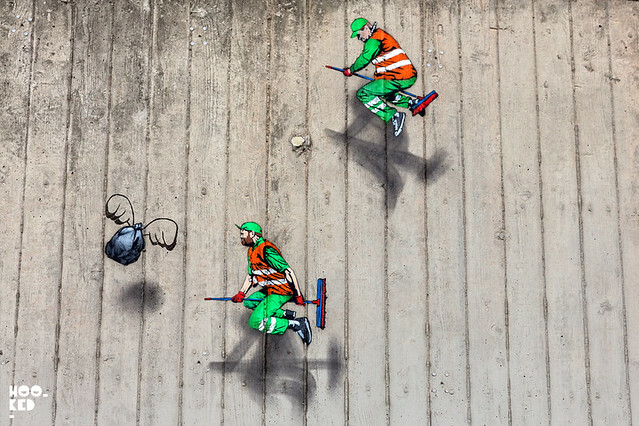 Each artist undertook a four-day residency on the streets of Ostend and in this same spirit Jaune has received the freedom of Stavanger to produce a series of installations and paintings across the city. “Nuart’s impact on our vision and goals, both on a creative and professional level, is not to be underestimated. 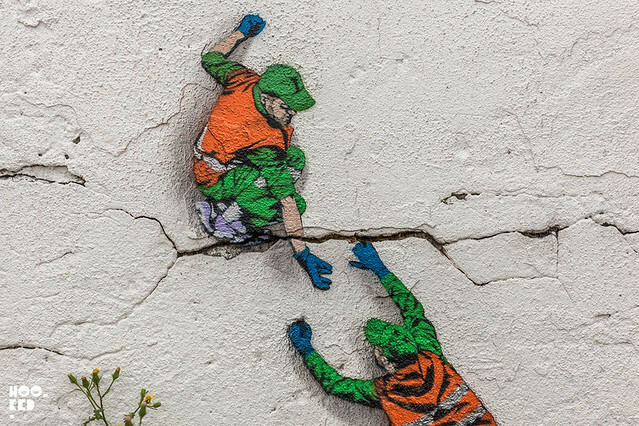 Although The Crystal Ship and Nuart have their own unique identities, we find common ground in the fact that we look to curate artists in a way that avoids pigeonholing the Street Art genre. 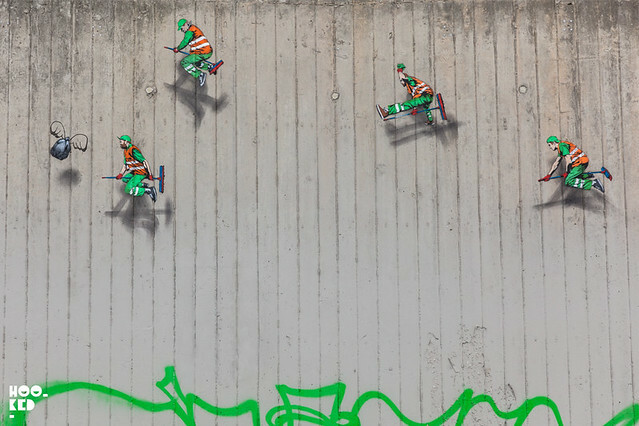 Jaune has been in Stavanger for a number of days now and has been taking full advantage of this freedom, with his characters popping up on walls across the city. We have shared a selection of the stencil pieces we discovered yesterday, we expect we will find addition works in the coming days as Jaune continues to install new stencil works on a daily basis! 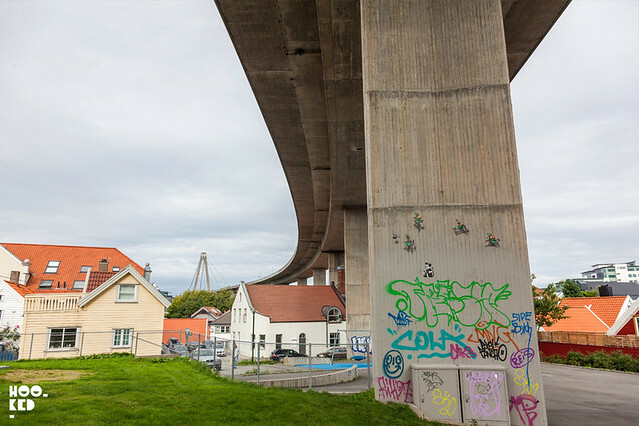 Jaune getting up high on the Stavanger City Bridge with his stenciled characters flying across the wall playing their version of the Quidditch from the Harry Potter movie. Hookedblog is in Stavanger for a few days and will be bringing you coverage from the festival across our social channels so be sure to join us on Hookedblog's Twitter and follow our daily adventures via our Hookedblog #InstagramStories on Instagram. 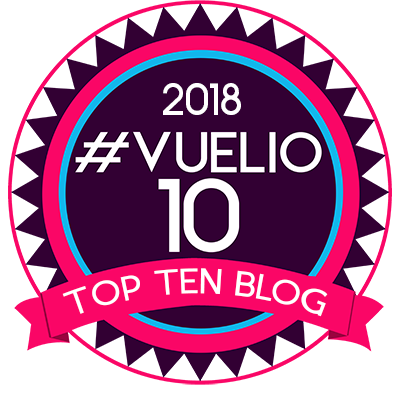 We will also be sharing images on the blog from our trip on our return so stay tuned. 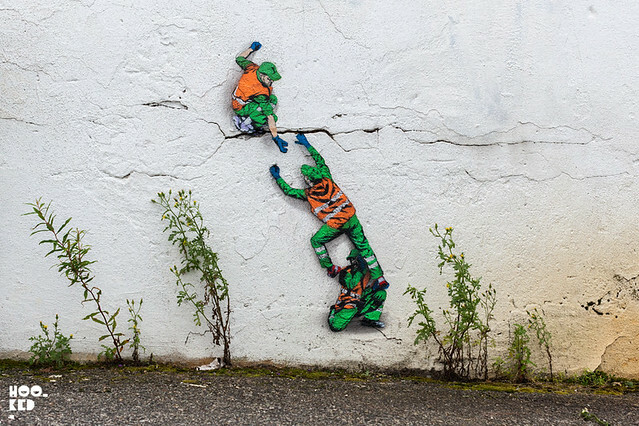 Taking over the Streets With Stencil Artist Jaune. 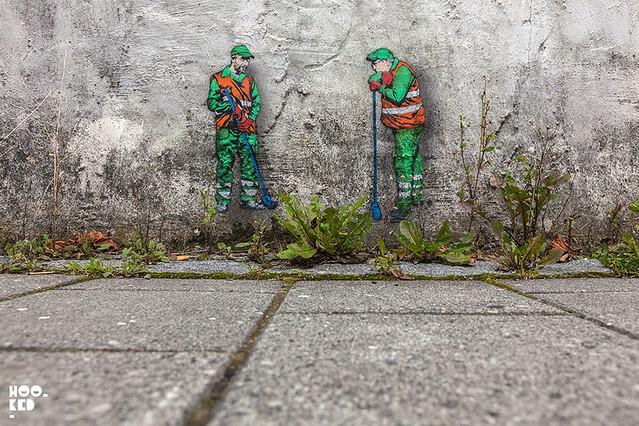 Hanging out on the Stavanger streets with stencil artist Jaune. 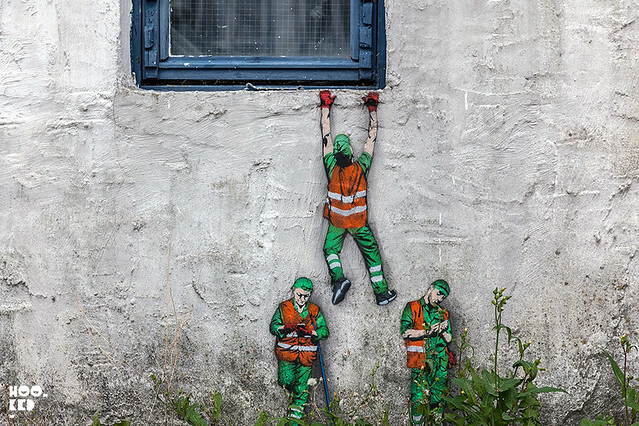 Belgian Street Artist Jaune hits the streets of London.